How much does a shrink wrap machine cost? A common question asked by customers who see our products and videos online. To answer that question we like to point out the basics of shrink wrap packaging. 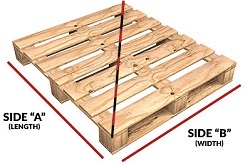 To professionally package items in shrink wrap users need three items: shrink film, a sealer, and a heating element. The film can be made from a variety of materials. The two most common types of film for packaging are PVC and polyolefin. A sealer is used to seal the open ends of the film once the product is inserted inside the film. Sealers come in a wide selection of prices, sizes, and production levels. A heating element is used to heat the film after the open ends are sealed. The heat from the heating element is what shrinks the film to conform it to the product being wrapped. When our sales staff is speaking with customers they begin by asking a few questions to help determine what type of shrink machine and film the customer may need. Once a couple of basic questions are addressed, the different options available can be presented. Let's start with a few questions to help determine the type of machine needed. What are your production levels or projected production levels? Many customers are new to shrink wrapping and do not realize that knowing production levels are important to help determine what type of machine is needed. Some customers are established businesses that are moving to shrink wrap packaging for established product lines. Most of the time, those customers are familiar with production levels. Other customers are starting a new business or producing a new product line and do not know the amount of products they will be wrapping because they do not have any sales. A properly forecast production level will assist in determining the proper machine to recommend. Efficiency and size are the two primary factors that determine shrink machine cost. What are the dimensions of the largest item to be shrink wrapped? What form of shrink wrap do you intend using? The three primary forms of shrink wrap commonly used in packaging is tubing, bags, and centerfnew. Determining the best form of shrink wrap is important when deciding on a shrink wrap machine. Different machines assist with sealing different types of shrink wrap. If you are not sure what form of shrink wrap you are interested in, call us and we will be happy to assist you. By addressing the three questions above, we can now help determine the best shrink wrap machine options for your application. Since there are many variables to answer the questions above we are going to start listing shrink wrap machines by production levels. This will give readers an idea of how much shrink wrapping machines cost. 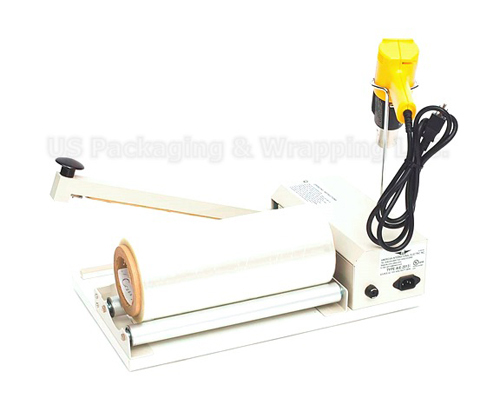 Impulse Sealer and Heat Gun - An impulse sealer and heat gun combo is the most basic type of shrink wrap machine available. Impulse sealers come in flat wire, flat wire with cutting blade, and round wire sealers. Each type of sealer has specific functions depending on the form of shrink wrap being used. Flat Wire Impulse Sealers- Ideal for heavier shrink wrap gauges. The flat wire does not offer the ability to seal and cut the film. They are often preferred for sealing non shrinkable poly bags and other plastics. Flat wire sealers range from $61 to $327 depending on the size of sealing bar. Flat Wire Impulse Sealers With Cutter Blade- The cutting blade on the top of the sealing bar enables users to quickly seal and cut film. 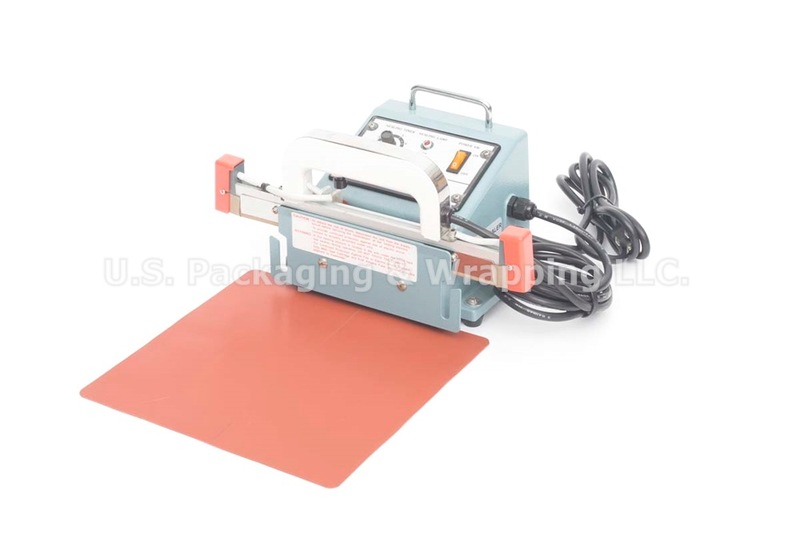 The flat wire impulse sealer with cutting blade can be used for any form of shrink film. We recommend it for anyone wrapping objects with shrink tubing. The cutting blade enables users to seal the tubing and cut past the seal to open the tubing for the next product to be inserted. These sealers range from $107 to $200. Round Wire Impulse Sealers- An excellent option for centerfnew shrink wrap and shrink bags. The round wire sealers offer users the ability to seal and cut the shrink film in one motion. We do not recommend round wire sealers for tubing because the sealer will seal the open end of tubing from the roll. Round wire sealers range in price from $68 to $190. 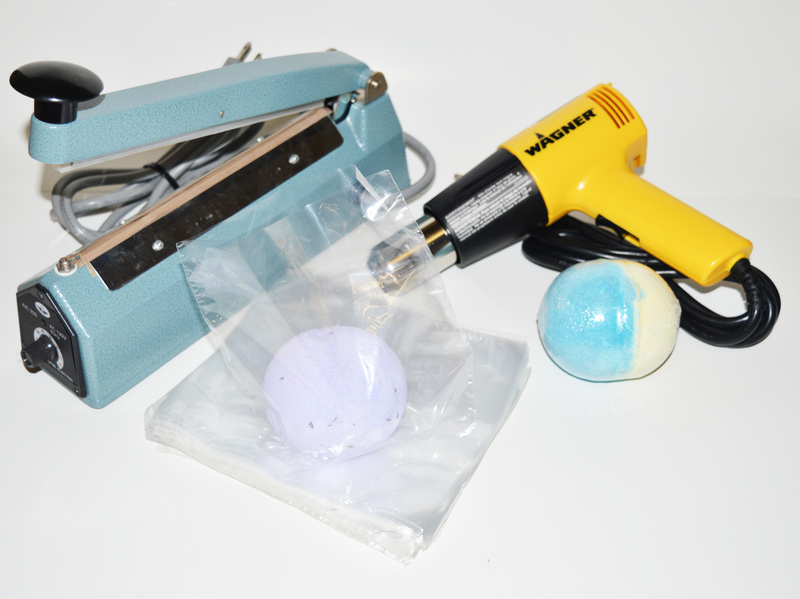 Heat Gun- Heat guns are the most basic heating element, ideal for use with low output operations. Heat guns get much hotter than hair dryers. We recommend them for anyone over a hair dryer. There are a variety of heat guns available. We offer two types, a two-speed heat gun and a variable temp. heat gun. The main difference between the two is the variable temp heat gun offers a dial that allows users to adjust the gun to multiple temperatures and the two speed heat gun only offers a low and high setting. Prices range from $54 to $77. The total cost for a low output shrink wrap machine can be as low as $115 for a sealer and heat gun. Costs can be higher depending on the size of the sealer needed. I-Bar Shrink Wrap System- One of our best selling machines. The I-Bar shrink wrap system comes with everything needed to begin shrink wrapping. Each system includes a 500 ft. roll of PVC shrink film, a heat gun, a work table, and a film rack. Anyone using a centerfnew shrink film should consider a shrink wrap system for wrapping products. Users can typically wrap up to 300 products per day using this system. I-Bar shrink wrap systems range from $236 to $445 depending on the size of sealer needed. Foot Sealers- A great option for users who choose to use shrink bags for wrapping products. Foot sealers allow users the ability to package products with both hands free. A foot pedal is used to raise and lower the sealing bar. Sealing is faster and more efficient. When used for packaging products in shrink bags we recommend using a heat gun or shrink tunnel depending on the desired level of production. Foot sealers are available from 12" to 32" seal widths. Prices start at $255. Portable I-Bar Sealers- The main advantage of portable I-Bar sealers is the ability to bring the sealing bar to the product being wrapped instead of bringing the product to the sealing bar. The portable I-Bar sealers have a detachable sealing bar that allows easy and efficient sealing. Portable I-Bar sealers are available from 12" to 32" sealing widths. Prices range from $500 to $700. L-Bar Sealers- L-Bar sealers are more efficient than I-Bar sealers for wrapping centerfnew shrink film. 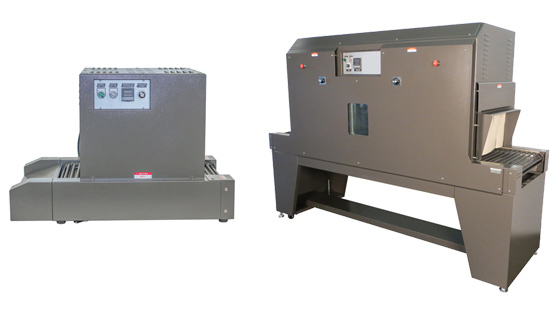 An L-Bar sealer has two sealing bars to seal both open ends of centerfnew shrink film. L-Bar sealers can be used in both medium and high output operations. 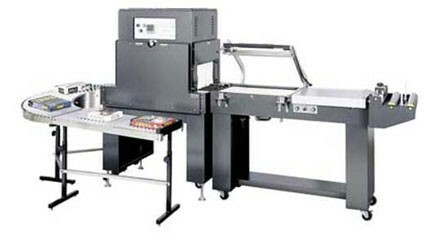 Automatic L-Bar sealers are typycally used in fully automatic high output operations. 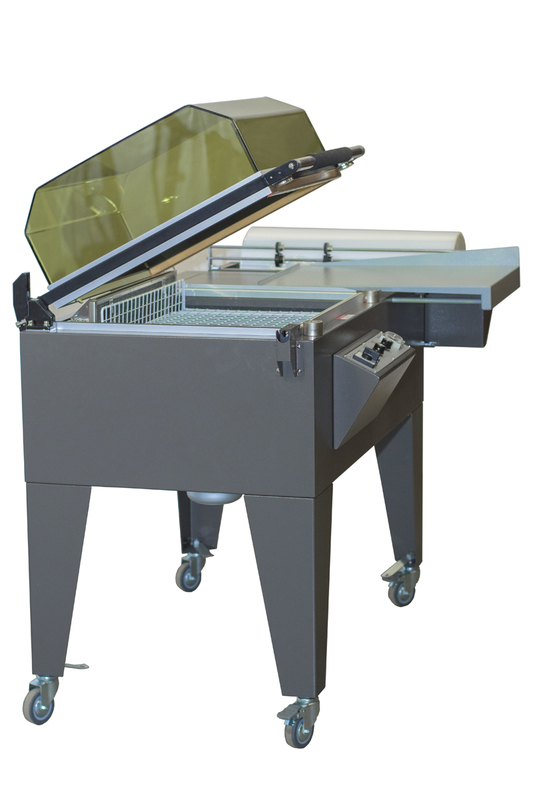 Manual L-Bar sealers range in price from $570 to $1250 depending on the size of the sealing bars. We recommend them to be used with a shrink tunnel or heat gun. 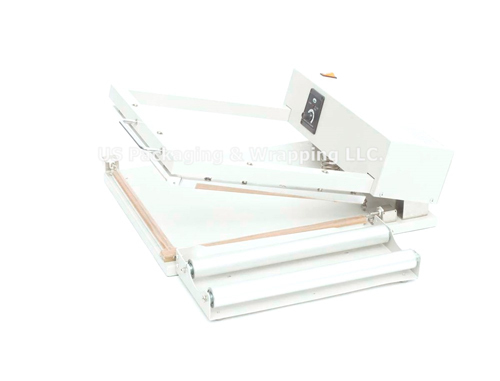 Users wrapping products with an L-bar sealer and shrink tunnel can wrap thousands of products per day. Shrink Chambers- A shrink chamber uses an enclosed L-Bar sealer and applies heat to the film once the seal is complete. Shrink chambers are all-in-one systems that quickly and efficiently wrap products in one motion. It is important to be aware of the height on each chamber. Since the sealer is in an enclosed chamber, the product height must be small enough to fit inside the chamber. Shrink chambers range in price from $2700 to $3500. Shrink Tunnels- We recommend the use of shrink tunnels for anyone producing a high volume of shrink wrapped products. Shrink tunnels are a high speed heating element and far more efficient than heat guns. Shrink tunnels are most commonly paired with a manual or fully automatic L-Bar sealer for maximum efficiency. Shrink tunnel pricing mostly depends on the chamber size. Prices range from $2000 to $6600. 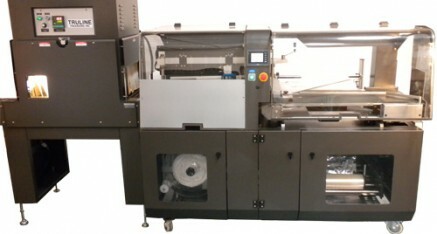 Semi-Automatic L-Bar/Shrink Tunnel Combos- These systems are connected wrapping systems that require an operator inserting products into the film and opening and closing the sealing sealing bar. These combo systems are highly efficient enabling users to seal thousands of products per day. Prices start at $12,000 and can go up from there depending on additional attachments to each system. Fully Automatic L-Bar/Shrink Tunnel Combos- Fully automatic machines are what large corporations use to package high quantities of shrink wrapped products. Fully automatic machines are capable of packaging up to 1200 to 1500 products per hour! There are a variety of add-ons available as well as multiple machines available. For a rough estimate on the low end price, users can expect to spend at minimum $33,000. Call us if you have specific questions about fully automatic machines and pricing.